How to get data on website? The main task of directory website is to merge the same type of information in one place. Yet the actual items in the online catalog can be different. This may be a company, gastro operations, doctors, dentists, nonprofit organisations, sports clubs and the like. The volume of such information is crucial for any website. So how do you fill up the directory website data? You can do it yourself, using your own personnel. 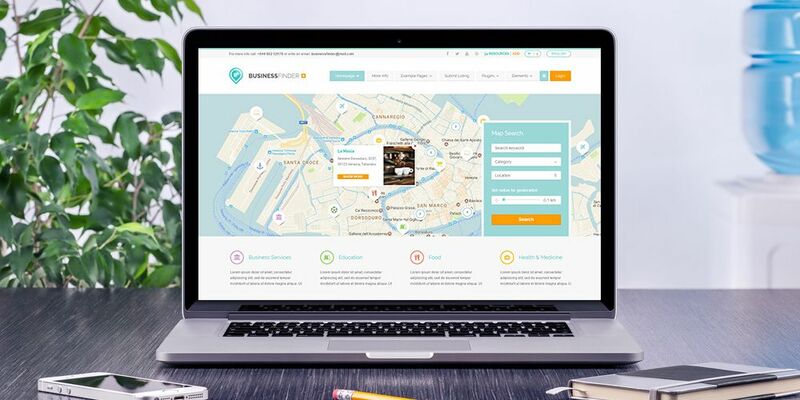 Or you can give access to company owners, operating companies, ergo those whom you want to merge on your catalog website to register and through their own account add information about them-self. If you allow owners to add items directly, valuable content on your directory sites will grow faster than loading all items in-house. So how about it? Choose the strategy. Free or fee? Disclosure of information on directory website is one of the components of process of managing sales on catalog website. Fee for adding items to the catalog list is a common way of how to make a website a profitable project. User pays for the package in which there are permitted certain functions and a set number of items (does not pay for each item separately). Many studies focused on pricing policy, recommend to offer several different packages. If they differ in price and content, they are more likely to generate a conversion for the benefit of your directory site. Your customer has therefore a better decision-making possibilities. The number of different packages is unlimited. Presentation site for them can be simply created using Pricing Table element. Settings for Theme Options –> Packages play an important role for your business Directory. In Packages you can define individual packages (subscriptions) for users, who will be registered on your directory page and add items. Package management is also important from the perspective of users themselves as you can customize the packages for each group of users and give them the opportunity to enter and display information as needed. If you are starting with a directory website, you should consider to allow users to add items free of charge, making it easier for you to get important content for your website. This makes it possible to build traffic and motivate users (owners of items) to opt for the higher paid packages with enhanced functions. In free package you can allow adding of only one item with limited input – information about item. So how to create different packages? Packages may be differentiated by time horizon, number of items pertaining to one user and the range of functions. Difference in packages can be in activating inputs such as opening times, picture gallery, social icons and so on. For each package, you can choose the type of header for detail listing presentation, or whether the item is included in the special group “Featured” listings. As administrator, in creating packages you have virtually unlimited possibilities of how to set those individual packages. According to these settings and permissions within the package you provide for users, you can adjust its price (eg. the more functions you allow, higher the package price). This way you can differentiate your pricing strategy. 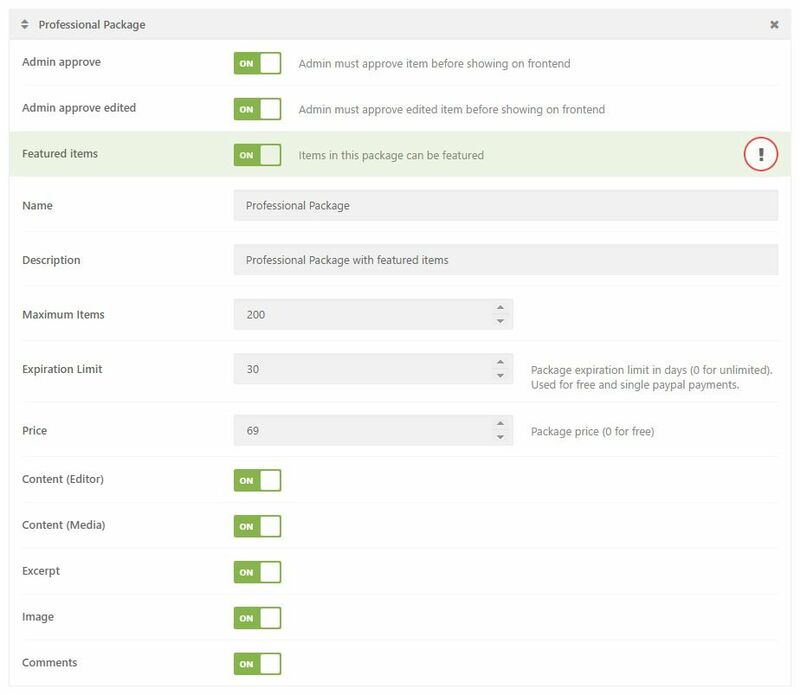 As part of the package settings you can choose to automatically sent notification of the impending end of package’s validity. Administrator decides to establish the basic, testing package. In the settings for Basic Package enables all functions related to the addition of Item – ability to add content, media, excerpt, image, etc …. He will set the price as 0, which means that it is a free package. But since it is a testing package, which is free, admin can reduce a number of items that can be added, for example 3 items. 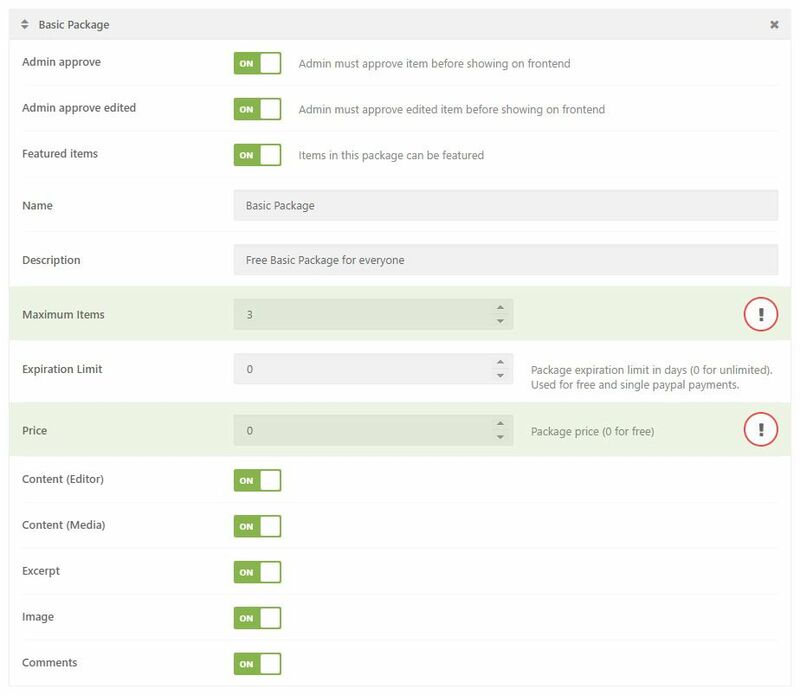 When user fills that quota, he will have to purchase a full-featured paid package to be able to add more items. With Standard Package administrator decides that he wants to adapt it for owners of small shops. In the settings he enables many functions, but not all of them. For example, he does not allow the possibility of adding Featured items (items will not be shown at the top of the list). He will set number of items to 10, package expiration for 30 days and the price at $30. For this package all functions are allowed to all the features, including Featured items during 30 days. The maximum number of added items will be limited to 200 items. Price $ 69. Professional Package will use those users who want to add Featured items and for example media agencies which promote different clients various activities and opt for advertising on the Directory page. Admin decides to create packages by type of business, adjusting the settings and price accordingly. Note: Package names, permissions and prices are merely illustrative and serve as an example. All settings are variable and can be adjusted according to the needs of the Directory page owner. The best part is that you create a widget once and then it can be used as many times as you need. No more duplicating of forms. For making it even possible for visitors of your directory website based on WordPress to ever register, you have to enable this feature in the basic settings of WordPress itself. Here you can see how to create a widget for users to register. 1. If user want to start adding his items, he must first sign up for specific package and pay for it. The only exception is a free package. Temporarily, until payment is made, he is listed as a Subscriber and adding items is deactivated. 2. After the payment, system will change the role the Subscriber to one according to the prepaid package and then he can start adding items. 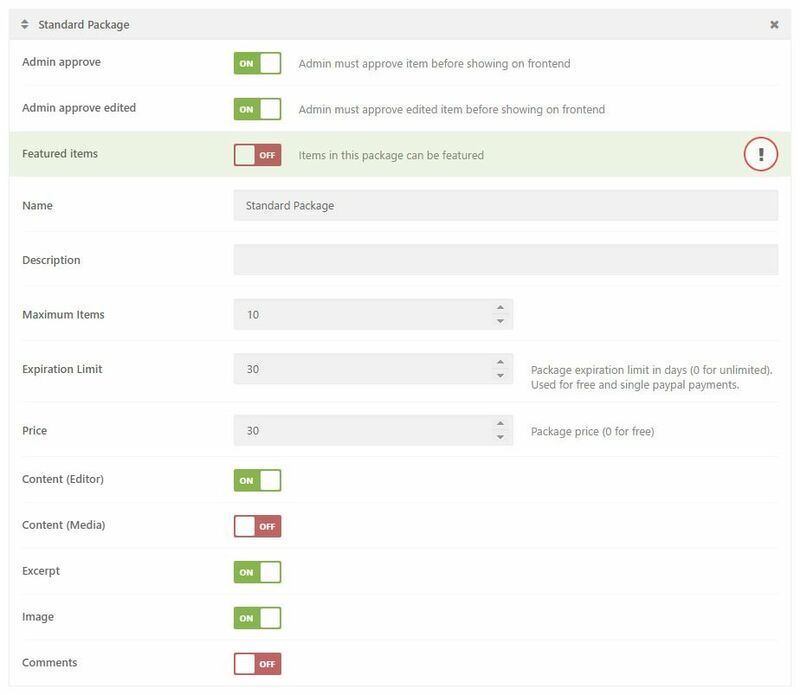 Authorisations for adding items, as well as their maximum number are based on the Packages settings set by admin. Which items can be edited by User? User himself can decide which data are for the business and its customers important and which are not. Directory templates contain a lot of settings and features, giving you a great tool for your online business. Watch more articles about how to work with AitThemes. Would you like to test any theme before purchasing? Download trial version. 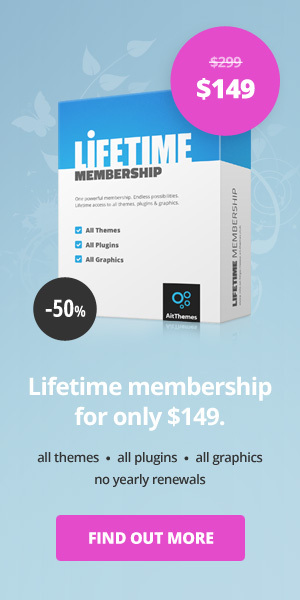 or you can uncover full version of 68 Themes, 25 Plugins and 173 Graphics. You’ll get all AIT products. Nice one. Unfortunately the front end submission [ with easy admin ] for companies is a terror. we highly appreciate your feedback. Thanks! By the way…what is the use with your packages if no one in my country uses Paypal or Stripe? 10 years in copywriting this author has??? This article is so hard to read… bad grammar and lots of spelling mistakes. Does not make me want to purchase! thanks a lot for your feedback, we highly appreciate it. Anyhow, would you mind to share with us what would you make happy, which kind of information or function would you require? As a result of a long research I came to the sad conclusion. In Russia (for example), the PayPal payment gateway is not needed. It is useless. Why? Because PayPal does not allow the use of API if I am not a legal entity. That is, to use the API payment I must be the owner of the company. But in this case, the payment gateway is absolutely not necessary. Because the scheme of cooperation between the two entities (my and client companies) may be easier, avoiding payments through PayPal intermediary (3.9% tax per 1 operation). If I, as the owner of the site, is a legal entity – I dont need a PayPal payment system – all package sales will be made by bank transfer through paying the bills. If I am a not legal entity – PayPal payment system can`t work with me, since under the terms I have to be an individual entrepreneur or be the owner of a LLC. In view of such circumstances I have an idea for AIT Themes (your colleague Zlatko has informed). Can your company’s developers to integrate one or more payment systems, which are very popular in Russia, Ukraine, Belarus, Kazakhstan and other countries of the former USSR? many thanks for your feedback, we appreciate it. There are many reasons why payment gateways are not available in all countries. Running directory website for profit is standard business activity therefore some strict rules are may applicable with countries. As it is electronic services VAT rule are very special within EU for example. Stripe payment is primary for US market. To implement new gateway into themes is not easy thing. I’ll forward your request to our management to consider such customisation work to implement payment systems you mentioned. can i learn more about how to include woocommerce and product sales within listings – specifically – which directory themes allow this and how do I set ti up? Is there a way of creating packages not accessible to the public? For example, I want to provide access to an agency for creating 100 items without having the package details available at the registration form. I wan to be able to create the package and assign it to a user I create and send them the login credentials once they pay (with Bank Transfer). Is that possible? Another important missing ability would be to connect advertisements with “item categories” or “locations” or even specific items (for better targeting and cross selling). we are sorry, there is no such an option to connect Advertisements custom post type with items or taxonomy menu element. Did you consider Featured Items functionality? Hello, I’m having trouble putting it all together. Can you provide an example of a existing directory(URL? )that is taking full advantage of all these functions? Not a bad article…though the theme could do so much more. Advertising – you offer it as one of the components but you can’t easily manage it in terms of providing usage stats for advertisers, you can’t offer it as paid add on to customer packages. Basically what I’m saying is that needs a bit more work. Ideally, you might want to display certain advert depending on the business category. Items – seriously guys who call’s it ‘items’ they’re business(es). I’ve tried renaming ‘my items’, even looked at the documentation which suggests adding the language pack. Done that, but the instructions no longer match what you need to do. Easy Admin – why does it add any additional meta boxes from admin installed plugins. I don’t want customers to override any settings from other plugins. That really needs sorting. I found a plugin that sort of works on some plugins but not all. thanks a lot for your feedback and compliments. We’ll definitely consider your ideas and make decision. The aitthemes directory themes seem fantastic to me. In my case I do not use packages, as I do the direct management of my directories. Just a suggestion … It would be okay to limit the number of images in the packages. thanks a lot for your compliments and for your proposal. We’ll evaluate the possibility to add this feature into user’s packages. we have themes/plugins made with responsive design. Once you are using a theme that is not mobile friendly, you should hire an experienced developer/designer or change the template. The customization of the theme requires a major intervention in the program. Firstly the Theme is great. Takes some time to understand. What do you mean by “opt for advertising” in the package configuration. Where is the option to select this . can you explain how this works? Also the price that we put in will be automatically for a monthly subscription right ? How does a end user cancel his subscription ? Can admins of web site cancel subscription ? Can you explain the cancellation process. thanks for your compliments. Opt for advertising means the decision for creating and managing the listing that belongs to e.g. media agencies. The price can be set for any period (Expiration limit section). Package expiration limit should be set in days (0 for unlimited). Can be used for both free and single paypal payments. Once yo create new packages it will appears as a new Role in admin -> users -> “Role” section. Consequently you can manage each registered user and change the role at any time. This option has only administrator. I bought you Business Finder theme and wanted to integrate the Registration and Login form. The only issue I’m having is that if the user chose are wrong username or email there is no error on page or pop up, instead it redirects to the homepage and a topbar pop up with the error saying that the username or email has been registered already. So the user would have to, again, go to the Registration page to try and register. thanks for asking. Yes, this is a way how does theme working. User should use another email or it should be deleted in administration by admin. I’m not talking about the validation process per say, I just have the issue with the re-direct going to homepage if they register incorrectly. It’s a bit annoying navigating again to the registration page and filling up your details again. Wouldn’t it be best to have a warning pop saying “This email or username is already registered” rather than a redirect to the homepage? thanks for getting back on this. We’ll re-consider it with our development team and make decision. I’ll contact you back soon. thank you again for your feedback and great feature ideas for our products. Your suggestions has been added to our list of ideas which we analyse further and the most wanted features are being implemented into our products.